Uganda 2013 "In The Land Of Beauty"
After just over a year since our GalileoMobile expedition to India, Khagol Rath, we embarked on a new journey, this time in Uganda. The expedition, named In the Land of Beauty after the Ugandan national anthem, was our first in the African continent. The expedition took place from the 23rd of September to the 4th of October 2013. During this time we visited 5 schools in Mbale and Kampala, reaching a total of about 4500 people, out of which 4400 were students and 100 teachers. Based on our previous expeditions, we stayed two days in each school, in order to maximize the time we spend with the teachers and the students. The experiences were recorded in the beautiful documentary In the Land of Beauty. The report about this expedition will be available soon. 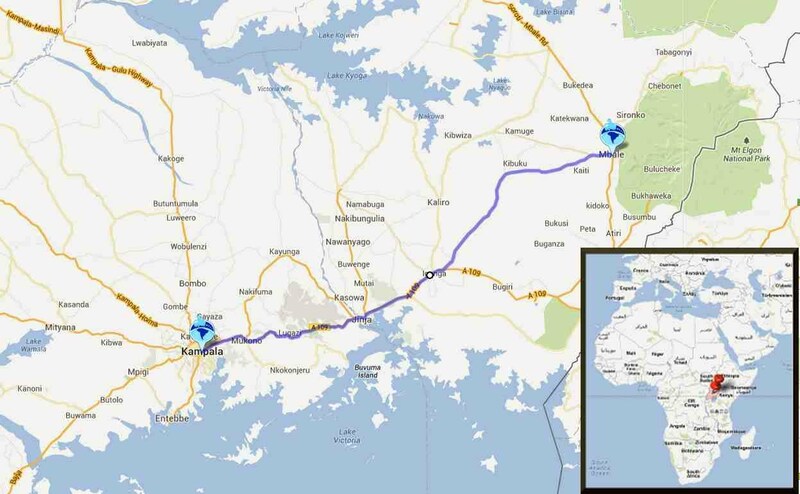 Roadmap of the expedition, linking the central region of Kampala and the eastern region of Mbale. The team also participated in the conference “Engaging Young People in Science and Technology” in Kampala between the 18th and 19th of September. We gave a talk about our project, presented a Café Scientifique session and carried out workshops for teachers and activities for students. An international team, formed of four GalileoMobile members (from Italy, Portugal, Switzerland and Brazil), two film producers (from Italy), a local collaborator and a driver (from Uganda), shared a van that departed every day from Kampala to visit schools. We visited three secondary schools in the region of Kampala, and two schools in Mbale. A typical day consisted of a short presentation of the group, workshops for teachers (related to experimental Physics and Astronomy, and endorsed by the Galileo Teachers Training Program and activities with the students. We worked in close collaboration with the teachers in order to carry out the activities with the kids. The day ended with sky observations and/or a café scientifique session. These sessions consisted of a short presentation about an Astronomy subject, followed by open questions and answers. The expedition was shaped with the invaluable contribution of Betty Kituyi Mukhalu and Duncan Dallas from Café Scientifique - Uganda, who made the contacts with the local schools. We would also like to acknowledge the following persons and institutions, whose help and support was inestimable — we all envision the same will of sharing Astronomy, science, knowledge and culture under a same sky, without borders!